I swear I’m starting to feel like that new song “I’ve Been Away for Too Long”. However, this time it is for good reason. As you can see by the picture and by some of my newer posts, I’ve been exploring other game systems, broadening my horizons if you will. This of course means I’ve been doing a lot of reading and getting in some trail games. I have to say that I’ve been very pleased and excited, so I’d like to take a moment to go over what I’ve found and enjoyed. Now, this is not going to be a detailed review of each and every game system that I’ve read so far; instead, it’s just giving the broad strokes and impressions that I’ve had thus far with the systems that I have read and tried. This game’s rule set is not pictured because you download and basically print it off. By many, this game is considered the gold standard for tabletop starship battles, and with the death of Battlefleet Gothic I figured it’s a good place to start. I did play a couple of games of Battlefleet Gothic last summer, but I personally felt there was something missing. I maybe the only person that didn’t particularly like the models, so I didn’t take to the game like I do with most tabletop games I play. However, I still wanted to play a tabletop starship game. After searching around, I found Full Thrust. It took until the beginning of this summer to actually sit down and read the rules. Fortunately for me, there was a game convention demoing the game the next week. The short of it is that I love the game. It has the freedom to do whatever you want, but the best part is that you can use whatever miniatures you want. Do you want to build and put down a Space Marine’s battlebarge with escorts? Go right a head. There are plenty of weapons, hulls, and tech to do a good job at representing a battlebarge. The mechanics of the game are smooth and allow for a fast game play, as it doesn’t do the Warhammer standard of I GO-YOU GO. If you’re looking for a good tabletop starship game with a very strong and active community, then I would suggest giving Full Thrust a try. My brother and I have been hunting for a game that would do a bit better in rewarding and simulating good use of tactics, tactical thinking, and maneuvering. We figured a World War II game would achieve this goal fairly easily, and would give us the added bonus allowing us to indulge our other interest: history. However, we would like something that would allow us to add a bit of Weird War II aspects to the game. I learned of Bolt Action when I watched a demo video of it on Beasts of War, and just by watching the video I was compelled enough to buy the rulebook. Reading the rules I’m really interested in starting this game. One of the good things about the game is that weapons and vehicles are given a generic title. A heavy machine gun for example has the same stat and does the same damage if it’s in a German army or United States army. This makes it easy for adding more custom or “weird” units like mechs to the game. I can pay the point for a Tiger II tank and just say that it’s a Tiger III walker. It doesn’t suffer penalties for moving through rough terrain, but doesn’t get a bonus for moving on roads. I got Dust because of the oh so pretty mechs they have, but also for the fact that it is a Weird War II game. This past weekend I went to a demo game of Dust Tactics, and had an enjoyable time. Now the rulebook I have is for Dust Warfare, which means that Dust Tactics is a separate game that uses the same miniatures and much of the same mechanics. From my experience with the demo game and how it was explained to me by a few people, Dust Tactics is somewhat like Heroclix in that you have a game map and units have base stats, weapons, and abilities and you go to town. Dust Warfare is more in line with a traditional tabletop war game; however, from my reading of the rulebook, it’s basically Dust Tactics with a few more things added. Units still use the same stats, abilities, and weapons that come on their card, and there is no upgrade mechanic in the game. I’m probably going to pass at least on Dust Warfare. I think Dust Tactics is fun little system to give me an excuse to play with little plastic army men and an even better excuse to buy the lovely models that go with the game. I’ve been told and have read it in a few places on the Internet that a good alternative to 40k is Tomorrow’s War. Similar to Full Thrust, it allows the player to custom create their army. Of course the biggest seller for me was the fact that Space Marines in Tomorrow’s War play almost exactly as they are portrayed in the fluff: nigh unstoppable killing machines on two legs. Now, I haven’t played a game of Tomorrow’s War yet as I’m still reading through the rules, but there are a few things that have me a bit gun shy about the game. To begin with, there is no points system in Tomorrow’s War. I’ve read across the Internet that there is a points system in the works, but the last update about it that I’ve seen was from sometime last year. In its place, Tomorrow’s War is more scenarios based where the number of troops is explained in the scenario. This is interesting as it helps to create a more narrative game, but there are not really any guidelines for creating your own scenario. Plus without a points system, there’s no easy way for two players to meet and play a quick game without having to hammer out a few details before hand. The other thing that is leaving me a little disappointed about the rules is the lack of detail. There’s not a way to get down and detail an army or unit beyond saying my unit is Tech Level 1, Troop Quality D8. The rules put an emphasis on the soldier and not his gear. I find this hard to go with, as it’s the combination of the soldier and his gear that can make or break an army, an engagement, and even a war. I’m holding out on this game, as I believe there is something special in. I just haven’t found it yet, and would love to hear from more veteran players. If anything, it seems like a good jumping off point for doing some home brew things. I finally picked up my copy of Apocalypse. I have always had the thought that Apocalypse was 40k should be. Titanic armies clashing in bloody gore filled battles that engulfed entire planets. This edition doesn’t do much to change what was fun about the previous Apocalypse game. 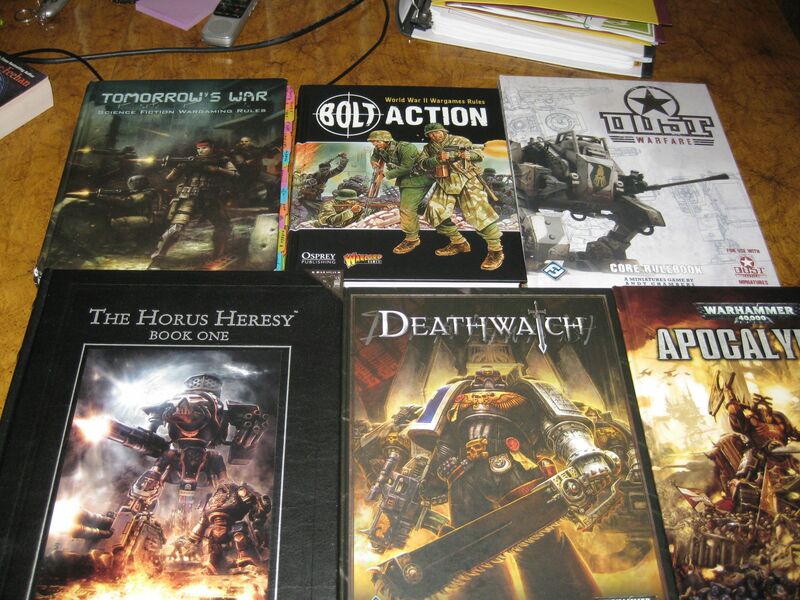 You still are allowed and encouraged to put you whole 40k collection on the table and play. There are a few changes that I think are for the better and I’m interested in seeing how they play out. To begin with, there is the change in the way formations are assembled and used. Players are not restricted to pay additional points to field a formation. They just have to do is put the models down that make up the formation. The formation is treated as one unit for deployment, but afterwards, units in the formation my act independently. The turn order has changed and is something that I’m interested to see. From what I can make of it, the turn is an almost free-for-all where everyone moves, shoots, and assaults at the same time. Afterwards, everybody breaks for a meal and come back to do it again. This seems to be a push by GW to help Apocalypse games go quicker: taking only a day to complete a game. I for one hope these turns out true. Most importantly, the rules for Space Marines are lose enough to allow the use of Heresy era Space Marine legions with little trouble, which means I need to get cracking on continuing my Horus Heresy army list tactica. Overall, there are a lot of little things that I think will add some flavor to the game, and continue to make Apocalypse a game of pure fun and ridiculousness. This by no means is the only set of rules that I have or plan to play. As you know from earlier post I have Deathwatch, and have been trying to get a proper campaign going. It just hasn’t come together what with trying to coordinate six peoples’ schedule. I’m also interested in picking up Flames of War, as it seems to be a very good system to represent a large army and battle. Basically, not having the crowding issue that Warhammer tends to have. Speaking of Warhammer, Warhammer Fantasy has peaked my interest after going through a quick demo game, but that’s probably going to be a back burner deal as I already have 40k taking up a lot of space in my office. Let’s not forget Infinity. That’s a game I’m really keen of starting. There’s also Malifaux. I wasn’t so much interested in the game as I was the miniatures, but with 2nd edition coming out next month I may give it a try. I’m also looking at a few other games that are in the vein of Tomorrow’s War and Weird War II: Secrets of the Third Reich, Stargruntz II, Gruntz, Nuts!, and Dirtside. The most eyes opening experience about reading all these different rules is seeing how some games are more refined, streamlined, or stronger that GW’s in certain ways. The most liberating thing about this experience has been the fact there is not a prerequisite to purchase the publisher’s miniatures. Aside from Dust Warfare, many of the rule systems that I have read either don’t have a miniature line, or they do have miniature line but it’s set in a genre that hundreds of other companies produce models for that genre: the World War II games. Talking with people, I have begun to understand better some of the criticism leveled at GW. I also am beginning to see that there maybe some brainwashing going on with the GW community. That’s not to say that I don’t still enjoy 40k and enjoy playing with 40k players because it doesn’t. 40k is what introduced me to tabletop gaming, and it’s been the game that played for years. I truly am a fan of 40k. I’m just beginning to develop a taste for other things. As always, I would love to hear what you have to say.